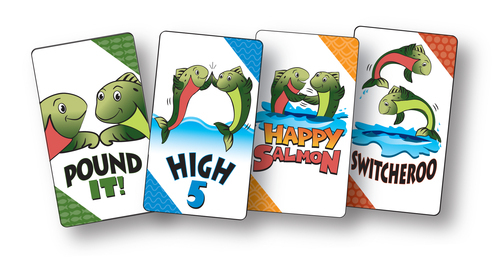 Happy Salmon is one of those quirky games where it’s going to take you longer to read this review than it would to just play a game of it – though, I’m going to try to get through the game as quickly as possible. Once you have successfully done the action, both players discard the card and move onto the next card on their pile. If there are more than two players who yell the same action, only the two players who actually do the action together are successful at the action. The other player has to wait until he has a match. If, at any point, you cannot find a match for your card and you don’t want to wait any longer, you can place your top card at the bottom of your stack and move onto the next card. The game continues until one player finishes his final (twelfth) card and yells “FIN-ished” – that player wins. Like BINGO, there are no ties. 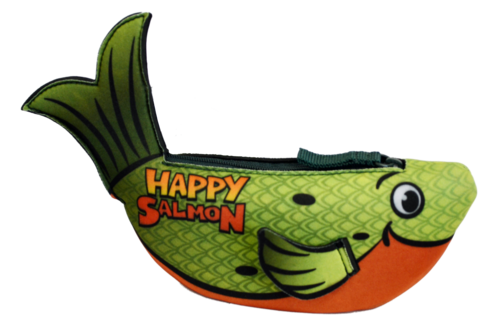 Happy Salmon is a cute little game, contained on a deck of cards, and cleverly packaged in a neoprene Salmon-shaped pouch. It is a boisterous game filled with yelling and laughing. After two short games at Origins, I was already hoarse from yelling and slightly winded from laughing through the whole experience. I would say that the best strategy here is to yell the loudest and be the most energetic. In case there are multiple people with the same card up, you want to make sure that people know what you’ve got! But, seriously, there is no strategy. Just start yelling and finding matches as fast as you can! This will make a great ice-breaker game, and I’m definitely looking forward to bringing this one to my next convention/invitational where it will certainly be amongst the loudest games in the room! This will also become my go-to game for any sort of Friendliest Person contest where the goal is to play a game with as many different people as possible! Nathan Beeler: Initially, Happy Salmon felt like Pit with a silly physicality literally slapped on it. This was a good thing, as I love Pit, and it led to a lot of laughter. Over time and several plays, however, Happy Salmon felt more and more that the game was playing itself. A player can almost always find a partner in Pit, and even when they can’t there are plays to be made (splitting a set, changing the collected suit). Heck, it often occurs that a player actively turns down a possible trade in Pit. In Happy Salmon there is no such quick thinking involved, only shouting and hoping for a match. The only recourse for being partnerless is to save the card for later, dropping it to the bottom of your deck. Of course, there is no guarantee that the new card will get a bite, only that the old action will be shouted vociferously as soon as you can’t join in. It seems against the Salmon spirit to continually flip through your deck until you find a match (though I might try that sometime just to see if it’d work). Shy of that you can find yourself just casting repeatedly into empty air: “High five! High five! High five? High five. High five.” Over and over. That never happens long in Pit, in my experience, which is why I’d much rather play that and forego the silly slapping (that I otherwise dig). Happy Salmon is already starting to stink a bit. Greg S.: Has no one else noticed the remarkable similarity to Hilarium, which was published by Mattel back in 2001? The mechanism is almost identical. Try to locate people possessing the same card as you without using words. In Hilarium, you are allowed to make sounds, which you supposedly cannot do in Happy Salmon. While Happy Salmon is cute fun certain to evoke laughter, Hilarium is so much better. Craig V: It was a lot of fun watching and listening to the chaos of others playing this game! Dan Blum: It’s not really my sort of thing. I agree with Nate that if you’re going to shout I’d rather play Pit. Happy Salmon can be played with gestures instead of shouting (which I guess is how Greg played given his comments), which I would prefer to do if I have to play it.